Approaching Denver by air from the East you see the vast end of the Great Plains neatly divided into squares of various shades from green to brown with the occasional vericose lump of houses and buildings swelling around one of the ruler straight highways. We descended into squares squares squares until we were quite low when all of a sudden the sprawl of the city simply began like a gray stain on those Plains. The Denver Airport is located a good distance from the City, and I took the new direct train into the City Center, terminating at Denver’s Union Station, one of the many original Gateways to the American West. All the way in the view from the train was of shipping containers and truck frames lined up in massive yards, sometimes with a long low warehouse at one end. 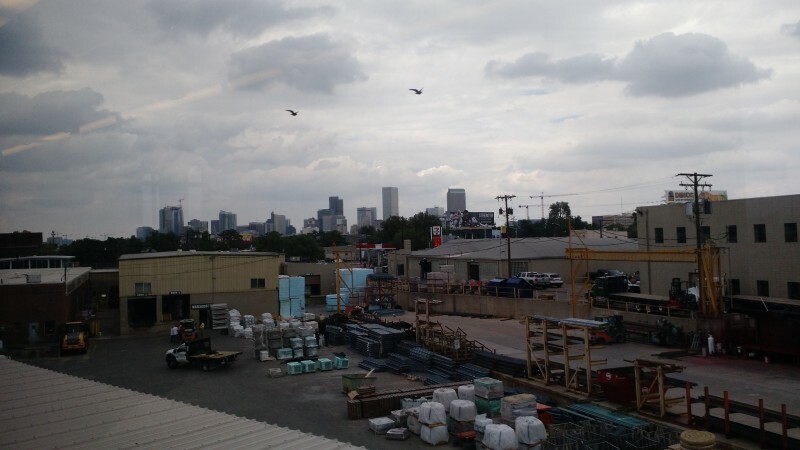 It reminded me that Denver is a shipping hub as much as it is the literal End of the Great Plains. From Denver’s sky scrapers the Rocky Mountains dominate the western horizon. Having never been to Denver before I found a shiny new city poking up from an ancient and important trading post. Once you arrive downtown the newness of this phase of Denver is sparkling clear. Most of this sits just south of the historic Union Station in a small “square” of the city plan that suddenly veers diagonally compared to most of the rest of the city which is hard set to the north-south-east-west grid, just as all those green and brown squares I saw in the Plains flying in. And in the southwestern corner of that off-kilter downtown grid sits the Sheraton Denver Downtown Hotel where this year’s American Cheese Society conference — “Cheese with an Altitude” — will be held beginning tomorrow. Having chosen not to test the Fates of Modern Travel, I arranged to arrive early the day before the conference. 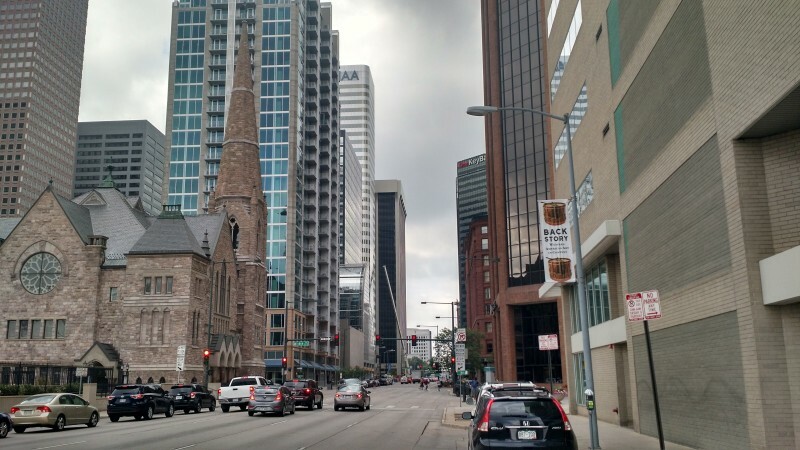 Having satisfactorily mollified those Fates my trip to Denver was without serious delay, allowing me some time to explore the city beyond my initial trip from the airport and then finding my AirBnB. I decided to walk six miles south between downtown toward the University of Denver campus. It took over two hours, but the forecast rain never arrived — it was actually quite sunny most of the way — and I was pleased to run into several beautiful parks and greenways along the way that made the walking very pleasant. I was most pleased to find a Farmers Market in progress in the neighborhood of Cherry Creek. It sets up in the corner of a huge shopping center, but their corner is bounded by a greenway on one end, and a nicely landscaped city street on another, so it did not feel connected to the vast and soulless parking lot beyond that surrounded each mega-chain’s megastore. 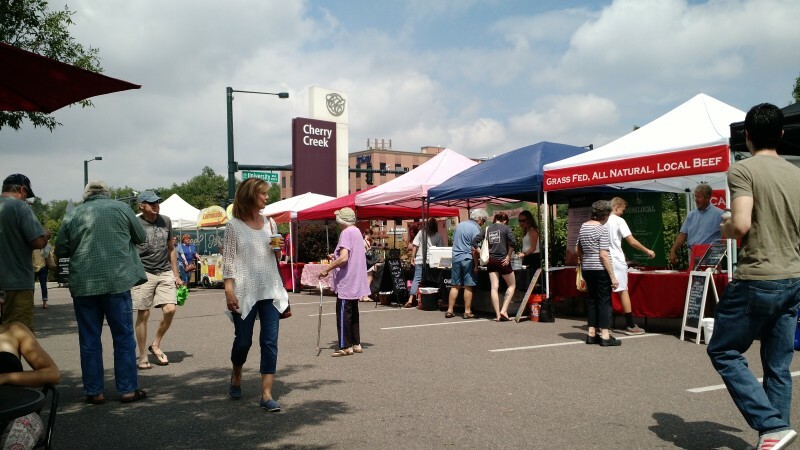 The Cherry Creek Farmers Market sets up twice a week from 9am to 1pm — Wednesdays and Saturdays. It was about the same size as the Belfast Farmers Market where I set up, but it had a different variety of items available beyond four veg and fruit producers. 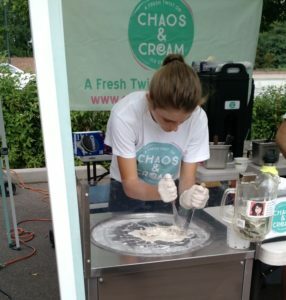 Most unusual was a vendor called Chaos and Cream that “cooked up” ice cream with your choice of mix-ins to order using an unusual device. In the place of what might be a “griddle” they used a large round plate that was super chilled. They ladeled ice cream base onto the plate as if it were pancake or crepe batter, sprinkled on the chosen “mix-ins” and then went to work scraping and chopping the congealing ice cream mixture, presumably incorporating enough air to make it “ice cream” as opposed to custard cubes. That was fun to see. 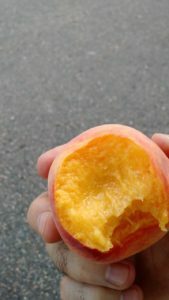 I decided to have lunch there as well, finding one single perfectly ripe peach from one of the fruit farmers, and then complementing that with two “Brunch Tacos” with different fillings. They both contained scrambled eggs in their filling, which seems to be what added the “brunch” qualifier. There were less pretty stretches of my walk, which sometimes entered shopping strips with eight lanes of traffic, or some areas that were more industrial/transportation focused. But my other main takeaway is that Denver is a city of people who enjoy the outdoors,and I was impressed by the number of people who were walking/running/biking all over the City. Given the proximity to the mountains that shouldn’t have been a surprise. BACK TO THE CONFERENCE: After my walk I picked up my conference gear in preparation for everything kicking off first thing Thursday morning. I am scheduled for two “Sensory Sessions” (aka Tastings) on Thursday — “Cheese R&D Comes Out From Behind The Curtain” and “Hops vs. 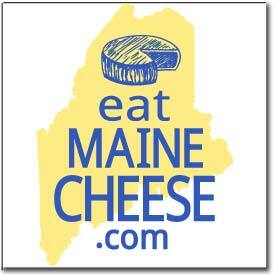 Malt: A Smackdown With Cheese” — and I will be reporting on that and more soon. Also of interest to me will be FDA Update and Lunch on Friday, as well as “A Survivors Guide to the PC Rule” as our FSMA implementation clock gets ever closer to December 2018. Until then: Please Cheese Responsibly.